All players, coaches, managers & team staff are required to register online. Registration for House 8U - 18U (Mites - Midgets) will open in early May. Do you have a question about one of our programs? Details on the Perinton Youth Hockey's 8U Red, White and Blue program can be found on the Our Programs / House Program / 8U Red, White and Blue page. Red team coaches are on the Coaches 2019-20 page. Please check the Travel Program / Coaches 2019-20 page for a list of Travel Team coaches and links to season plans. This page will be updated frequently with season plans as they become available. PYH is now accepting Coaching Applications for the House Teams for the 2019-2020 Season. Please complete this online form to apply. If you have any questions please contact Kent Stauffer directly via email. 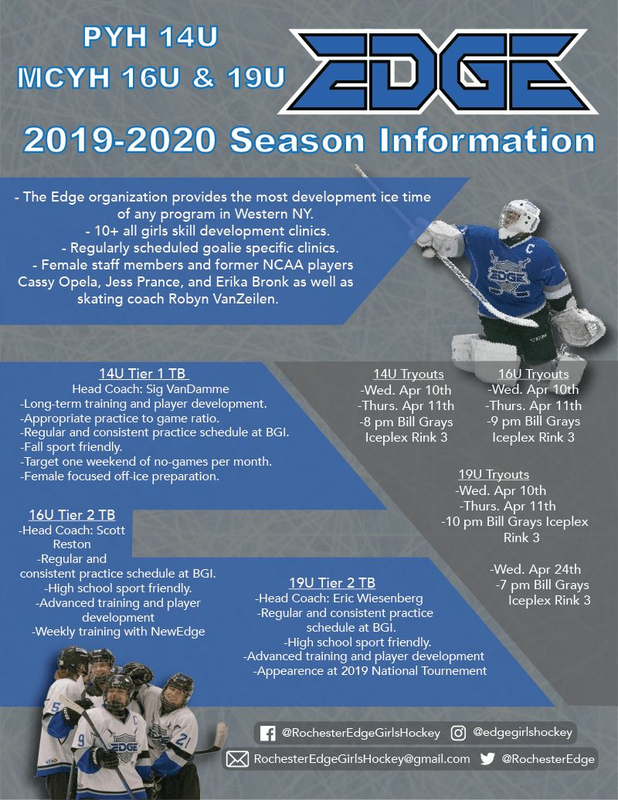 Beginning with the 2019-2020 travel hockey season the Rochester Selects Midget Hockey Program will be launched at the 15U and 16U Midget levels. The 16U Rochester Selects will play under the Perinton Youth Hockey USA Hockey charter as a Tier I state and national-bound tournament team. During the fall portion of the season the Selects will play in the highly competitive BEAST league’s top division to offer the players a highly competitive schedule and maximum exposure to prep schools, junior programs and NCAA colleges. Following the fall season the schedule will include one away weekend and one home weekend a month throughout the high school season against national competition. This schedule will allow players the option to compete with their local high school program or, if they choose, additional training on, and off, the ice with the Rochester Selects staff. The 15U Rochester Selects will play under the Rochester Youth Hockey USA charter as a Tier I state and national-bound team. Like the 16U Selects, this 15U team will participate in the BEAST league’s top division during the fall portion of the season and follow with the ‘soft-split’ season model. The schedule would look to add one home weekend and one away weekend against national competition following the BEAST league season and Western New York playdowns. The schedule model will also allow players the option to play for their local high school programs during the high school hockey season. Board meetings are held in the PYH Room at the Rochester Ice Center. All are welcome to attend. If you have an item you would like added to the agenda, please email Nedra Miller, nedra.miller@perintonyouthhockey.org, at least 3 days before the meeting. Click here to download the USA Hockey flyer. Want to get more involved with Perinton Youth Hockey? Our board is always looking for new volunteers to help with many aspects of the organization. If you would like to volunteer please complete the Volunteer form and we will contact you. Interested in Camps & Clinics ? Click our "Camps & Clinics" tab at the top of the page for local programs. Former NHL star Ray Ferraro was asked to talk to parents of a club that was going through a tough time, with parent expectations at an all-time high. This is what Ferraro told the parents. – Minor hockey is out of control in terms of Parents chasing the dream for their kids instead of kids deciding on their own how passionate they are for it and how bad they want it. – In the last 10 years only 21 kids who either played at NSWC or BWC have appeared in at least ONE NHL regular season game. Point is if your banking on your son collecting an NHL pay cheque to solidify his and yours financial future you seriously need to stop and come up with a new plan and now. – Don’t pay for power skating, dryland training, skill development and expect your son to score 50 goals, if you decide to invest in extras do it because your son asked for it and wants to improve and has a smile on his face each and every time … too many parents decide what they want their kids to do instead of their kids asking to do it. – Coaches are coaches we all know the game and think this should be done a certain way … how come we never tell our kids math teacher how to teach calculus but we think as parents we have the right to tell a hockey coach how much ice time and with whom and when our kids should play. – When you evaluate your kids season, never base it on how many banners they won, what provincial they won, what tourneys they went to and won … ask yourself what improved from September to April, what did he learn or improve upon including non-hockey stuff … evaluate the season besides wins and losses but gains and improvements. – I have a son who is going through the rigors of pro hockey in the AHL. Hockey is a tough racket. Growing up, my dad never talked to me after a game or practice, I did that with my kids. Just let them play, learn and develop. Pressure is high enough, no need to make it worse. Parent and players can find a wealth of information about USA Hockey's American Development Model (ADM) at their website, admkids.com. Be sure to check out the newsletters on the site which are updated frequently. Recent topics include training, off season skill development, etc. Download the 2017-21 Rulebook, 2017-21 Casebook and/or the 2017-21 Summary of Changes. Also available is the Off-Ice Officiating Manual. 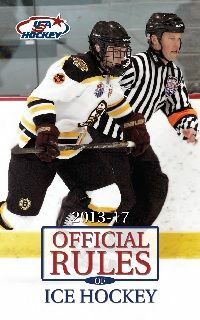 There are many more Rules and Resources available on the USA Hockey website.